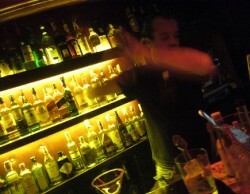 “When the temperatures start to rise, many in Barcelona head out of the city for the traditional August break. But for me, it’s the perfect time to enjoy balmy days and sultry nights, seduced by the weather and the sound of the cicadas. Barceloneta beach is undoubtedly the most famous, but being a tall foreigner there are one or two hazards I prefer to avoid. It can be hard to sink into the sound of the waves if the local beer-sellers decide I’m their perfect lady for the day. They are always incredibly polite, but it can get wearing being asked twenty times in thirty minutes if I’d like a nice cold beer. Plus, I really don’t drink beer under a hot sun. So for the beach life I’ve taken to heading to Ocata, far from the crowds, and within easy reach of Plaça Catalunya on the train to Blanes. Within a short time, I’m whisked away on a clean and air conditioned train to the beach, where the beer sellers are far less persistent. The view from the train often seems like being on a boat, as the train magically glides above sea-level. It stops right at the beach, where you step straight onto the boardwalk down to a clean sandy stretch. It’s a way to really unwind, floating in the warm waters, snoozing on the towel, and I never have a sense of the ‘body police’ patrolling for those of us without a perfect Hollywood figure. I can pick up pieces of fresh coconut from the friendly vendors without being constantly hassled. 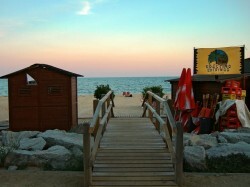 There’s also plenty of beach cafes and showers. The whole affair can roll into a leisurely day out, complete with a picnic. 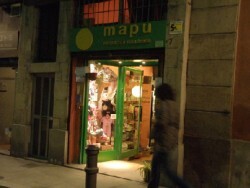 Back in Barcelona I like Mapu (c/ Magdalenes, 7) for food and all sorts of eco-friendly supplies, including Ecover (and for anyone with children they have a fantastic selection of green family lifestyle products). I’ve tracked down Quorn at the ubiquitous ‘English shop’, A Taste of Home (c/ Floridablanca, 78) – where others go for their Tetley, I carry out whole scale raids for Quorn products to fill my freezer. Although there’s plenty of health food stores here (for example, the Veritas chain is all over the city and in my hometown of Sant Cugat del Vallès), the problem is I’m not a big fan of textured vegetable protein. I got spoilt with Quorn back in London, and along with the odd cup of Yorkshire Tea, it’s one habit I’ve kept up here. Ruth is an acupuncturist with a clinic in central Barcelona, plus a home visit service offering Traditional Chinese Medicine and Cosmetic Facial acupuncture. She has been living in the Barcelona area for one year.